With a solo release and a Cross Rhythms Roots & Branches Festival appearance under her belt, Helen Yawson has been establishing herself in the ever-expanding UK gospel music scene. Lins Honeyman reports. The album 'Blessed And Highly Favoured' is yet another example of the quality of original gospel music currently being produced in Britain. This album marks a departure from Helen Yawson's continuing involvement in the London-based Kingsway International Christian Centre (KICC) choirs and her excitement is obvious: "God has given me songs that contain a message of hope and I aim to share the wonderful Gospel of Jesus Christ with many who don't know about it yet." Helen's voice has a breathtaking beauty combined with a unique boldness that gives her lyrics a conviction that is so characteristic of gospel music. It is clear that her voice, the music and the message have touched the hearts of many. "Shortly after I came to know Christ, I started singing in churches and people would say, "That song you sung really blessed me." Helen recalls, "Initially, I'd just go, 'What?!' But then I began to understand that this was a gift that God had given me to minister to others with. 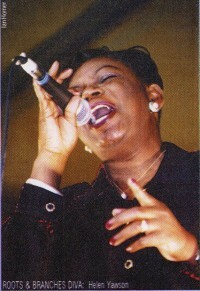 God has blessed me with the ability to sing and has anointed me in what I sing." This anointing is obvious in the writing process as the mostly self-penned 'Blessed And Highly Favoured1 testifies. "My songs sometimes come out of times I have in worship after my time of prayer." Helen explains, "Sometimes what I say to God can then turn into a chorus and then before I know it I've got a verse. Or it could be a line from another song or something the pastor has said, for example." Helen's decision to release an independent album is typical of a new approach to recording taken by many UK gospel acts who, in the past, were naively awaiting for the "record deal" that never arrived. "Beforehand, people were not putting their material down on record but nowadays more and more gospel artistes are releasing independent albums and not just waiting for a major label to sign them." The release of 'Blessed And Highly Favoured1 has certainly helped Helen to take the message contained in her music to a wider audience. "I'm willing to play at a variety of places. It has sometimes been the case where a black artiste may just be asked to play in black churches, for example. I don't believe this is what God wants -I believe he wants his artistes to be integrated." Tours of Canada and Nigeria with the KICC choir and her recent appearance at the Cross Rhythms Roots & Branches Festival evidently show Helen's commitment to achieving this goal. Aside from her role as music co-ordinator at the KICC church in Tottenham, Helen is already at work writing material for her next album. She sees 'Blessed And Highly Favoured' as a means of spreading the Gospel. "On the whole, I have had good responses from churches, festivals and bookshops and my album is currently being stocked in places like HMV in Oxford Street which really helps." It would certainly seem that 'Blessed And Highly Favoured' is not only an appropriate album title but also a fitting description of how Helen Yawson and her ministry is being touched by God.